When you think of Spring fashion, what comes to mind? 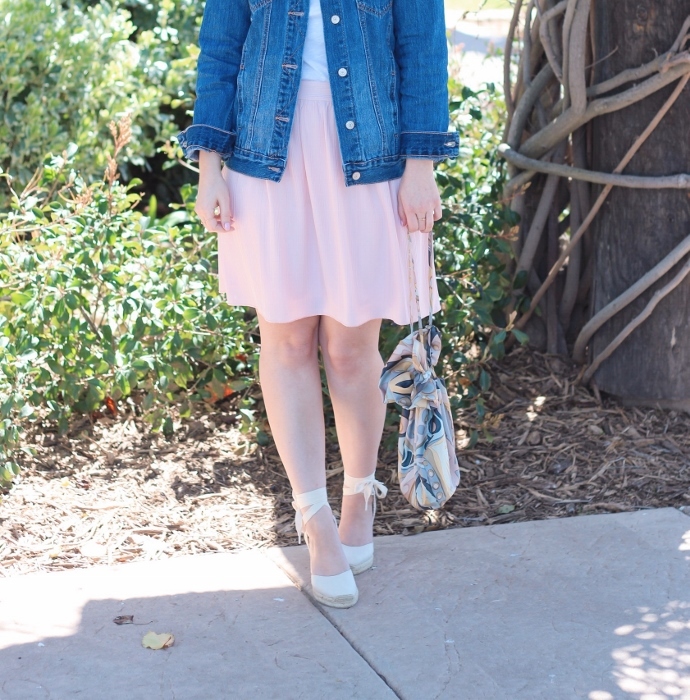 I think for most of us Spring inevitably means florals, lighter neutrals, pastels, and open toe shoes. But what about a denim jacket? There's definitely room in every closet for this great Spring staple, and you'll likely reach for it more often than not as a lightweight layer. Throw one over shorts and a slim tee for a casual weekend look. Layer one over a smart black jumpsuit and a pair of wedges. Tied around your waist over a tunic and leggings or joggers for running errands. 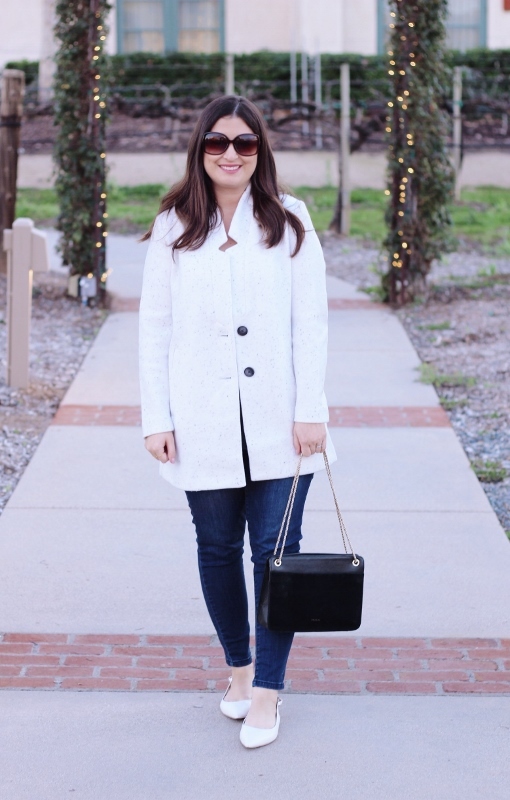 Mixed with other shades of denim, especially white, black, and olive. Over maxi dresses, mini dresses, floral dresses, white dresses, any dress! Have I convinced you? That's a rhetorical question. I hope everyone is having a great start to April! Nate and I are heading to Palm Springs this weekend...I'm so excited! I want lazy pool time, margaritas, and beautiful desert sunsets. I'll be back next week with some fun posts. My favorite part of transitioning from Winter into Spring clothing is being able to pull out my warm weather accessories. Making the switch isn't always easy, especially during the in-between - one day it's raining and cold, the next it's sunny and warm. Shoes, handbags, and jewelry is a great way to incorporate a new season when the weather's not entirely ready to make up its mind! I always start with accessories. Below are my absolute must-haves for Spring. Everyone needs a pair of these minimalist shoes. So chic! I've had most of these items since last Spring, so I'm happy that many of the same trends are still relevant now. Shop my picks below. What are your favorite Spring shoes and bags? Oh hey guys! I'm sorry I was M.I.A. last week but I didn't have much to say! I used to beat myself up over lack of posting but I'd rather only do so when I'm actually in the mood. And let me tell you, I'm definitely in the mood after having such a beautiful weekend. It truly felt like Spring...nicest weather so far this year. I'm also thoroughly enjoying the time change. Nate and I did quite the running around. We drove up to Los Angeles on Saturday to visit my dad's side of the family and it was lovely. Sunday we celebrated a friend's birthday brunch on the Queen Mary in Long Beach. 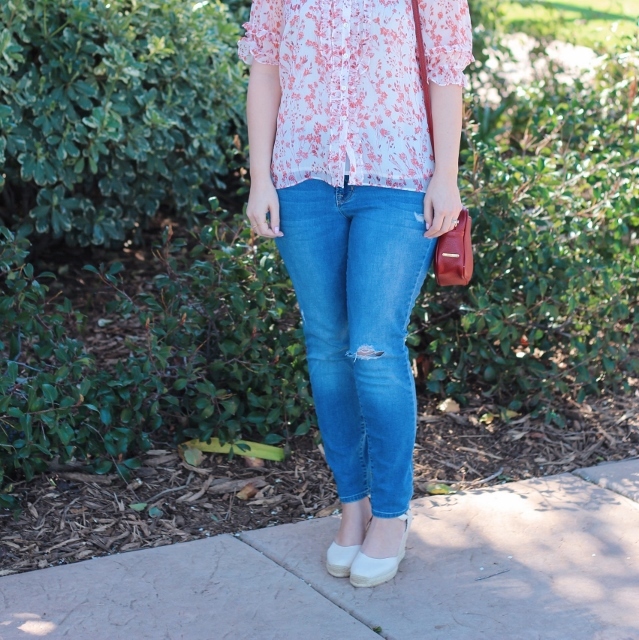 I wore this pretty floral blouse on BOTH days...no judgment okay?! The unexpected warm-up threw me off in the best way possible. It was a perfect 80 degrees and sunny, zero clouds in sight. 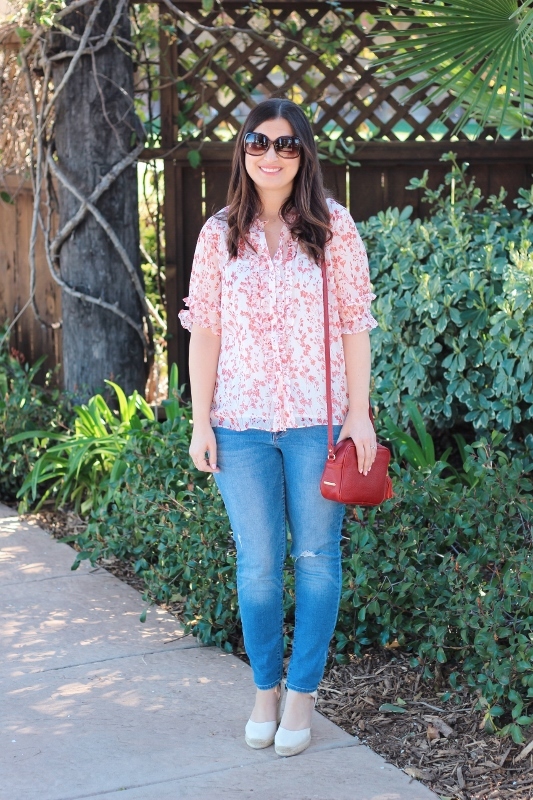 What better way to transition into Spring than by wearing something floral? 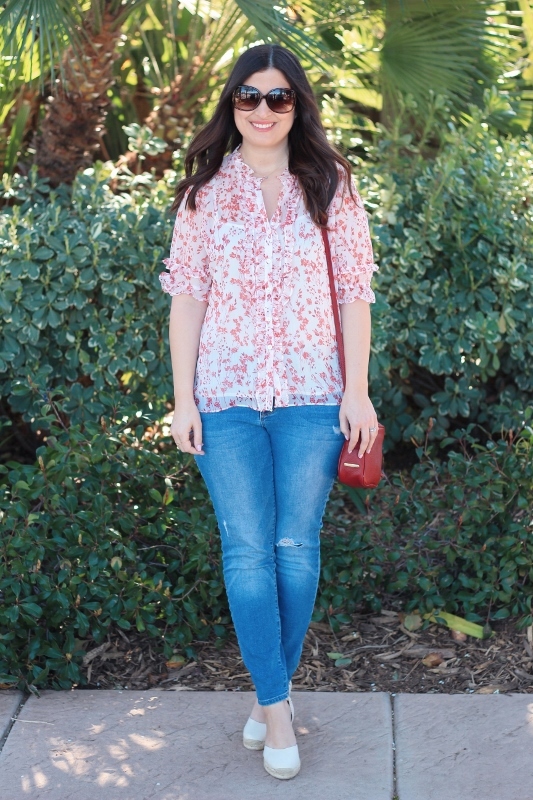 The little red flowers and ruffled sleeves looked great with my lighter wash jeans and wedge espadrilles. I ordered them during the Shopbop sale and absolutely love them. Here's hoping for more sunny days ahead! Is it feeling like Spring yet where you live? Like most people, I find the transition from Winter into Spring a little bit frustrating. You know it's just around the corner, but it's still too early to break out the bathing suits (unless you're lucky enough to go on vacation somewhere warm). With all of the rain and gloom this year, what can I do but simply appreciate California's break from the usual dryness and heat? I'm embracing it, because I know it won't last forever. With that being said, this type of outfit is one I've been doing a lot lately for nighttime. 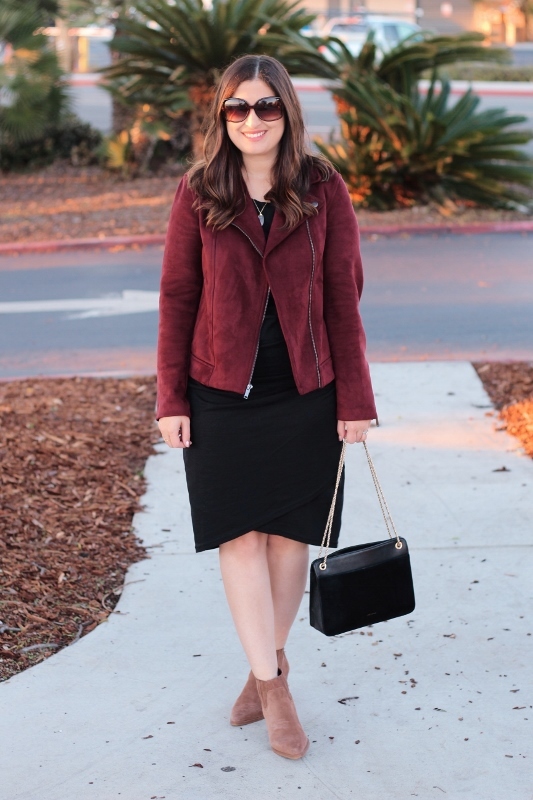 Last Saturday we went to San Diego and this suede moto jacket from Blank NYC kept me nice and warm! It's pretty heavy, so I've struggled at times with finding practical ways to style it. However, a chilly February presented me with plenty of opportunities and now I'm currently keeping it by the front door so I can throw it on and go. 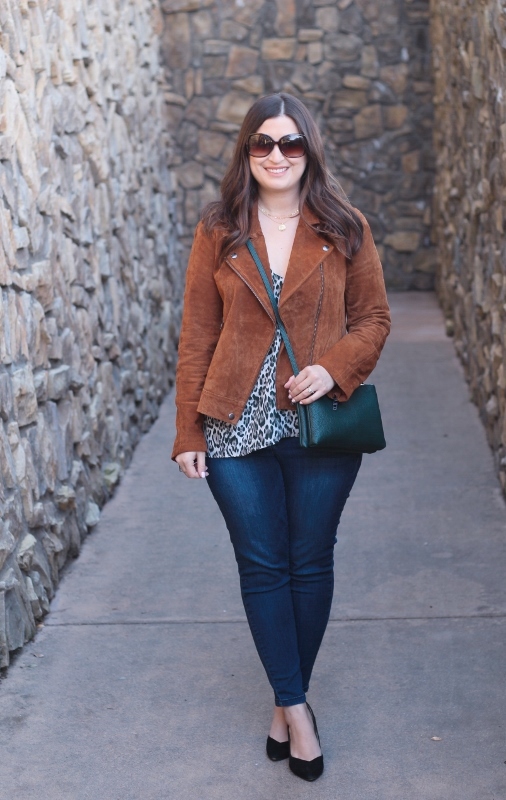 Paired with my favorite denim and new leopard cami, it's the perfect topper for a chic "night on the town." 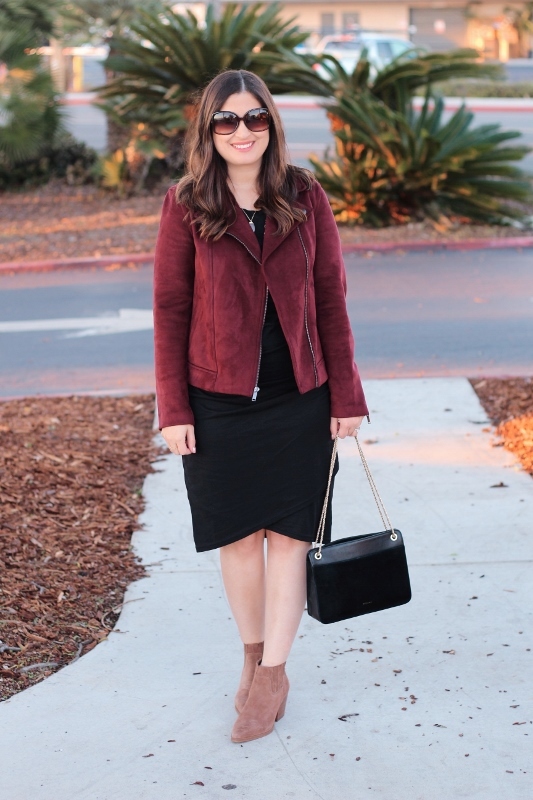 What do you wear for a Winter night out? 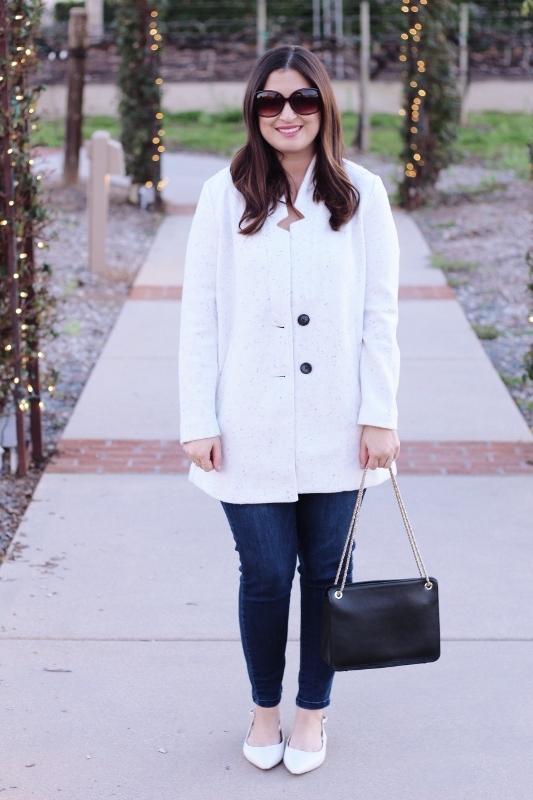 Today, I was planning on telling you guys about this pretty Winter white coat that I recently bought, or maybe writing about the fun weekend we had planned with friends...but life decided otherwise. These photos were taken on Valentine's Day, after the rain had subsided a bit. By California standards, it was freezing cold. Last Friday, Nate injured his hand at work. That wasn't the bad part though. After seeing the blood, he fainted and went down hard on the concrete of his shop. He lost consciousness for a few seconds and them came to with a circle of terrified co-workers surrounding him. I got the call around lunchtime, and by the sound of his voice, I knew something had happened. We spent the rest of the day in the emergency room, where thank God the doctors told us that his cat-scan was normal. He had a concussion and a cut on the back of his head from falling, but luckily nothing too serious. It could have been much worse. We spent the rest of our weekend mostly lying in bed listening to podcasts. We were supposed to go up north for a festival with our dear friends, but obviously that didn't happen after doctor's orders for strict "brain rest." My big outing was taking Nettie to the dog groomer. I don't mean to make things sound more dramatic than they were, but the whole episode scared me and it's definitely forced me to put life into perspective (yet again). I mostly feel like I stumble and wander through my days, constantly taking things for granted. It's sad that it takes something like this to re-focus on the things that matter, the blessings we all have that take a backseat in daily life. Tomorrow is Valentine's Day, and while the general consensus this year seems to be one of indifference, I'm actually looking forward to it! Nevermind that I'm 34 and married 5 years. Or that it sorta feels like a made-up holiday. I still enjoy any excuse for Nate to bring me flowers, even if it's mandated by the greeting card industry. This is what I'll be wearing tomorrow, whatever we do! 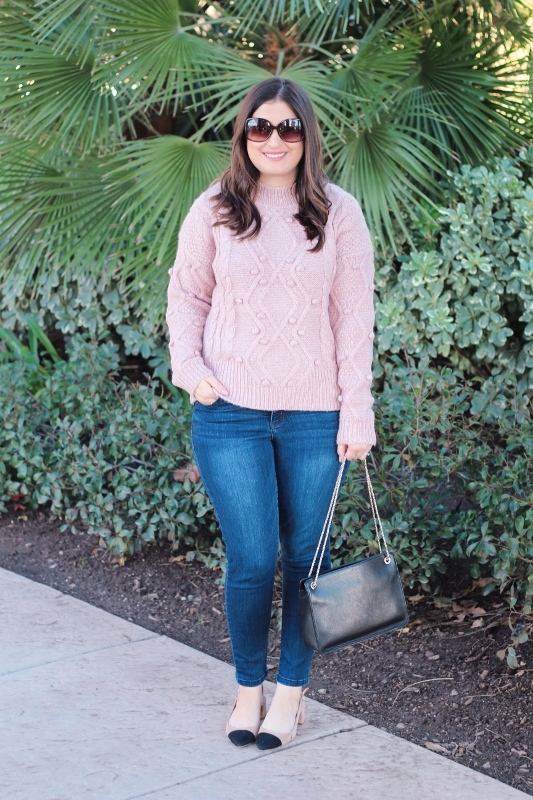 Usually we go out for dinner and drinks, and this cozy blush sweater will be perfect. I ordered it from Revolve last weekend and immediately fell in love with the color. I know I've told this story before, but I met Nate in 2003 when I was 18 and he was 21. We had a mutual friend that set us up to go on a blind date. It was supposed to be on Valentine's Day, but I postponed the date because I had prior plans with my girlfriends. Looking back, I can't help but admire my chutzpah. I mean I no longer know some of those girls because we parted ways after graduation...but I was in no hurry to ditch my friends for a guy. We instead went out a couple nights later and it was like at first sight. We continued seeing each other for a few months, broke up for a couple years, then reconnected again, and the rest is history. This is probably why I enjoy Valentine's Day, as it brings me right back to 18 and all those fun, crazy emotions of first love. Luckily for me, my first love became my forever love - and now I'm blushing, so I'll stop there. As I get older, I approach style very differently than I used to. I used to dress mostly to please others, and to convey an image of who I wanted to be. Now that I'm in my thirties, I dress mostly to please myself, and to convey an image of who I am presently. In other words, what you see is what you get. And that makes getting dressed everyday so much more enjoyable. Whatever your style may be, there are certain classic pieces that look amazing on everyone and are sure to save you time and effort. Consider them the building blocks of a practical, thoughtful, and yes even chic wardrobe. 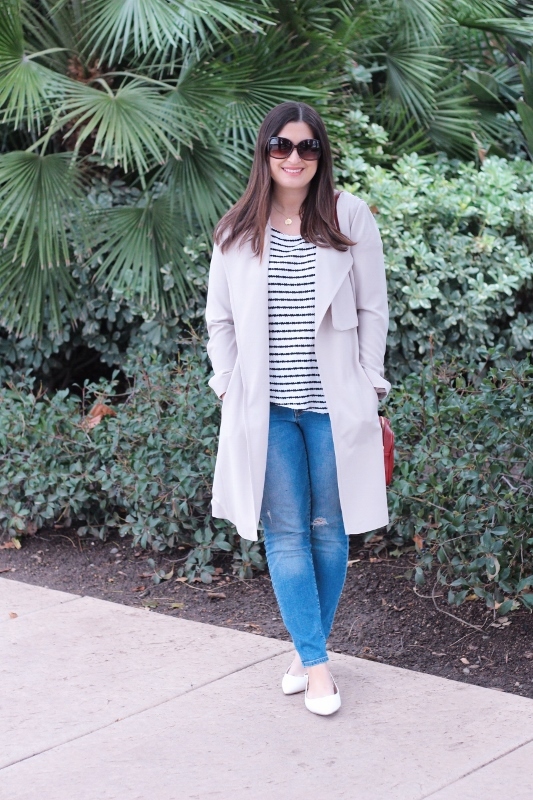 Neutral-colored soft trench coat: A soft trench coat is obviously less structured than a traditional trench coat, but it still looks just as polished. The one I'm wearing is a few years old from Macy's, but brands like Express and Asos have had versions every year. I find the draping of these coats extremely flattering. Stripe t-shirt or top: Who doesn't own at least one striped top? Put it to use as often as possible! Perfectly lived-in denim: There's nothing like your favorite pair of perfectly soft, slouchy, lived-in jeans. It doesn't matter the brand, as long as they fit like a glove. 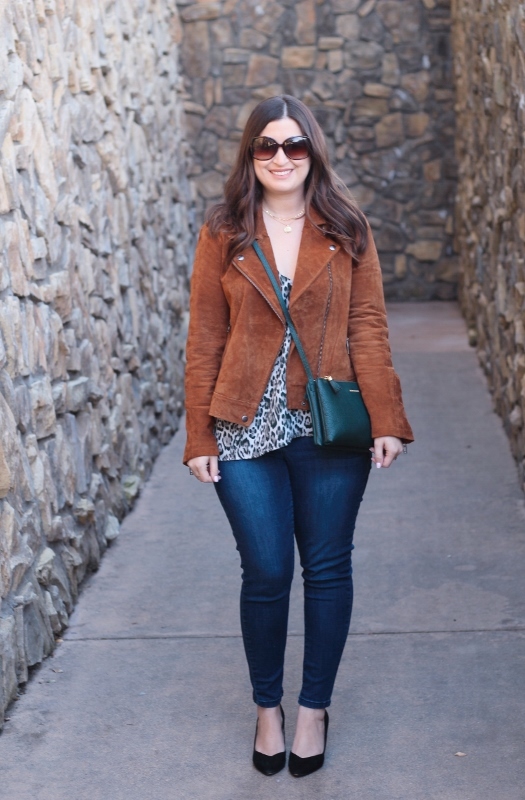 These are my most-worn pair of Old Navy rockstar jeans, and I wear them weekly. The lighter wash and (very slight) distressing make for an instant classic pair. Red bag: Red is such a power color, and a great leather crossbody bag can take you from day to night and from the office to happy hour. It really adds instant polish to any look. 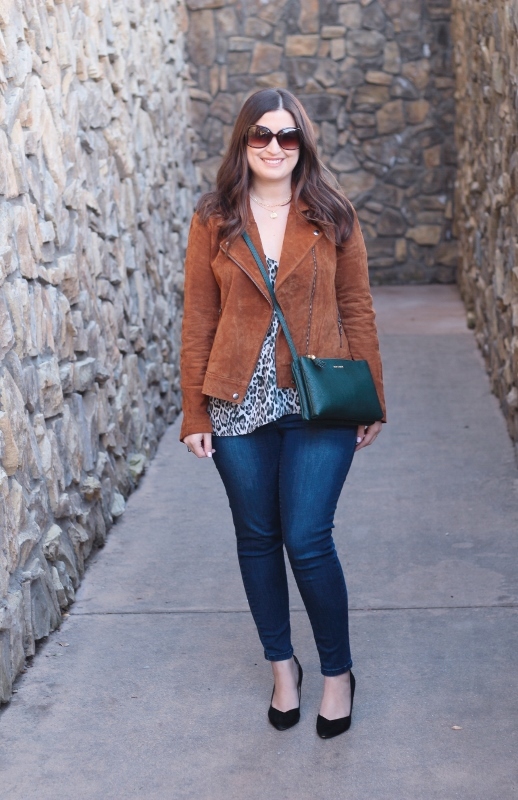 Pointy-toe flats: Not everyone likes flats, and not everybody finds them comfortable, but I've been a pointy-toe flats girl since Stacy London championed them on "What Not To Wear" about a decade ago. They're great for lengthening your legs when you're not into heels. Wear all of these pieces together, add a current trend to break up the look, or mix them in with your other wardrobe favorites. Classic doesn't have to = boring! 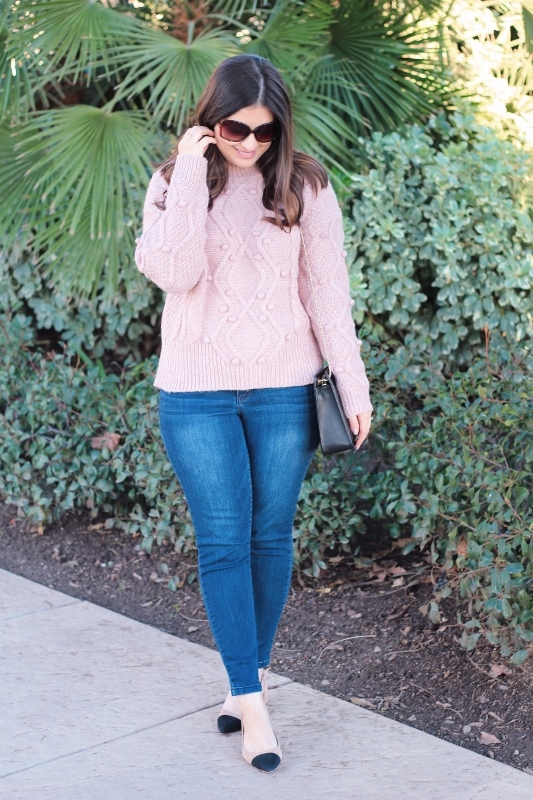 If there's one item that I've been absolutely living in lately, it's this plush-knit cardigan. 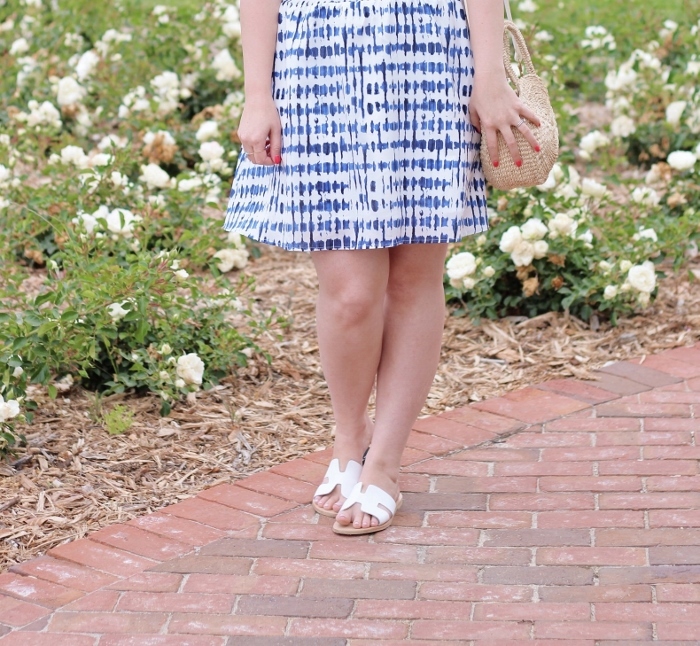 I've had it for awhile, and even wore it on the blog over my favorite fitted dress. 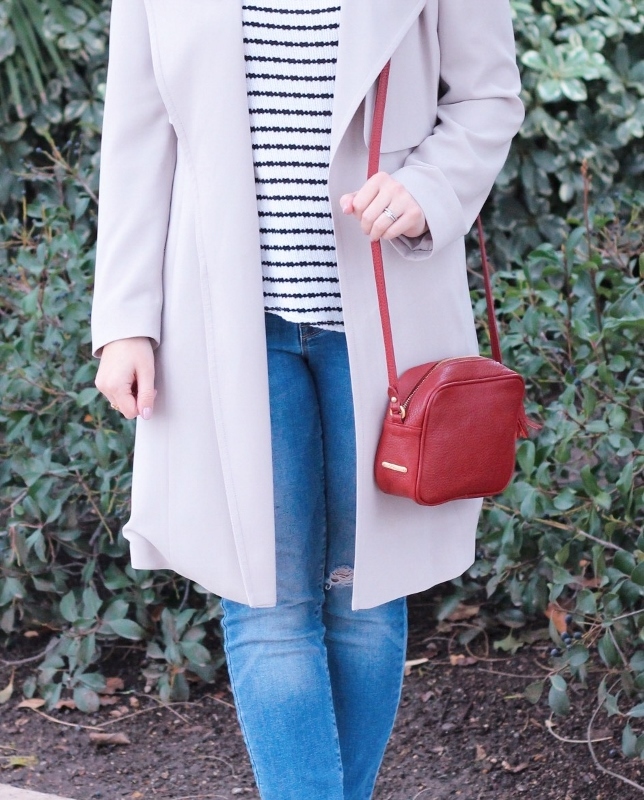 Now that it's Winter and layering is a must, I reach for it weekly. 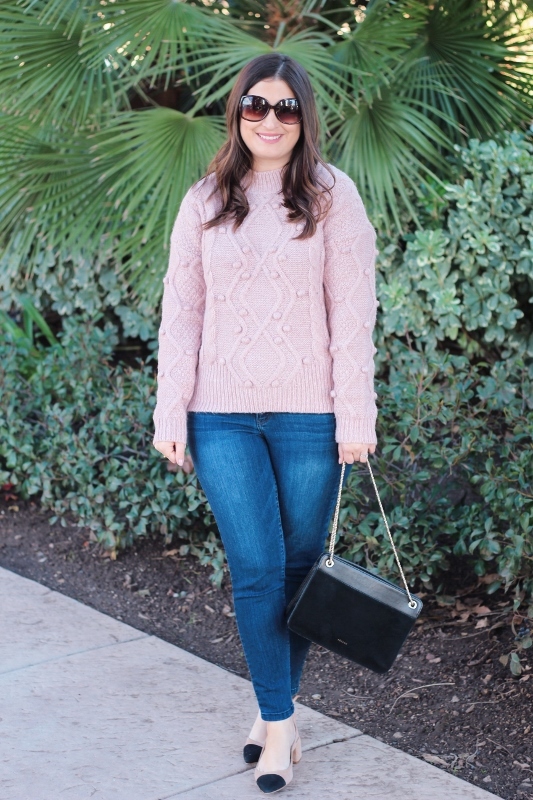 What I love about cardigans is that they are universally flattering on every body type, they can be worn both to the office or while lounging, and they are just so simple to style. I personally favor longer, open cardigans with a looser fit but...these can also drown out my figure i.e. my waist. This is where a belt comes in. I had completely forgotten what a great styling tool a belt can be, particularly if you have a curvy lower body. In order to accentuate those curves I added a wrap-style leather belt, and cinched it in at the smallest part of my natural waist. Styling note: I think in order for this to work best, an oversized cardigan is key. 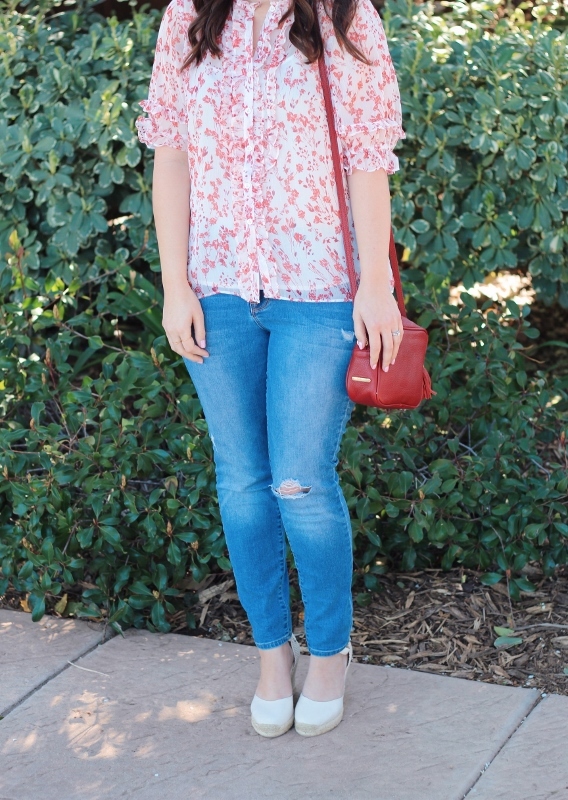 It gives my denim outfit some dimension and interest, and the effect makes me feel so feminine. Do you ladies wear belts frequently? 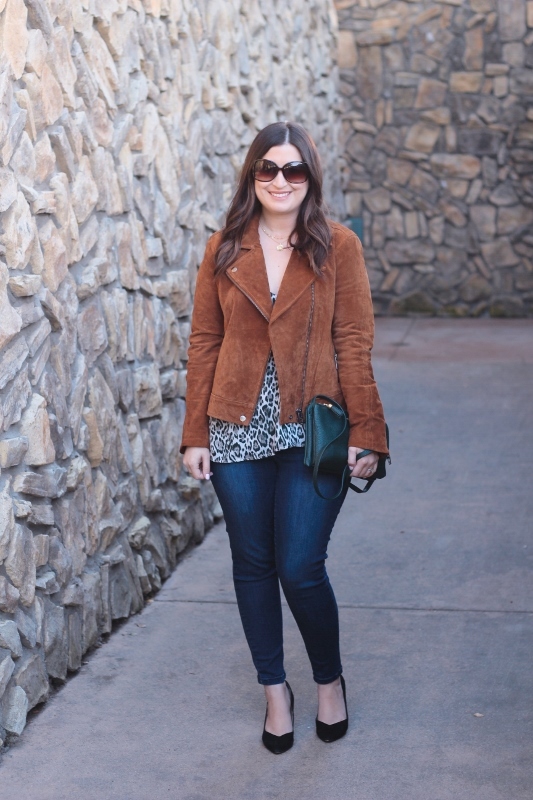 I hope I've convinced you to give this style strategy a try! Just a quick life update: our dog went into surgery on Monday and although she's uncomfortable and in some pain, she's recovering just fine. It's her second ACL surgery and I'm amazed by her toughness and strength. I could learn from that. 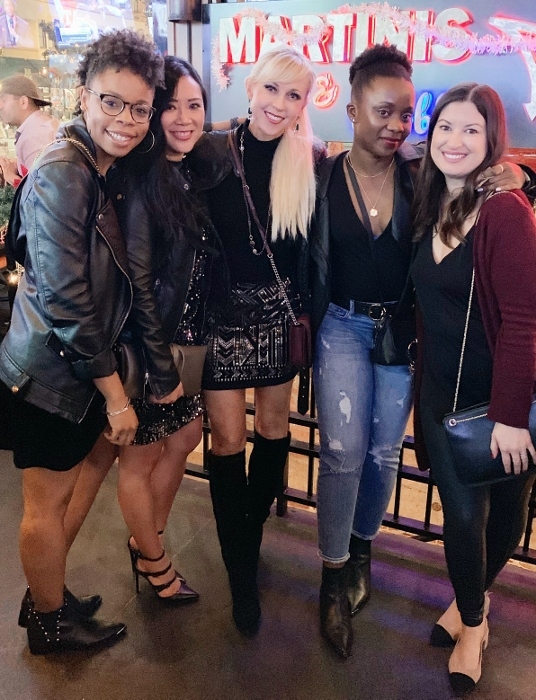 Monday also happened to be my friend Gina's birthday, and I had such a great time celebrating her over the weekend along with our husbands. We always have fun on our date nights. Gina and I blab about clothes and blogging, while the guys blab about pretty much everything else! Happy New Year! I'm not sure why it's taken me so long to write my first post of 2019 but I'm back today with a little reflection on the year that was. 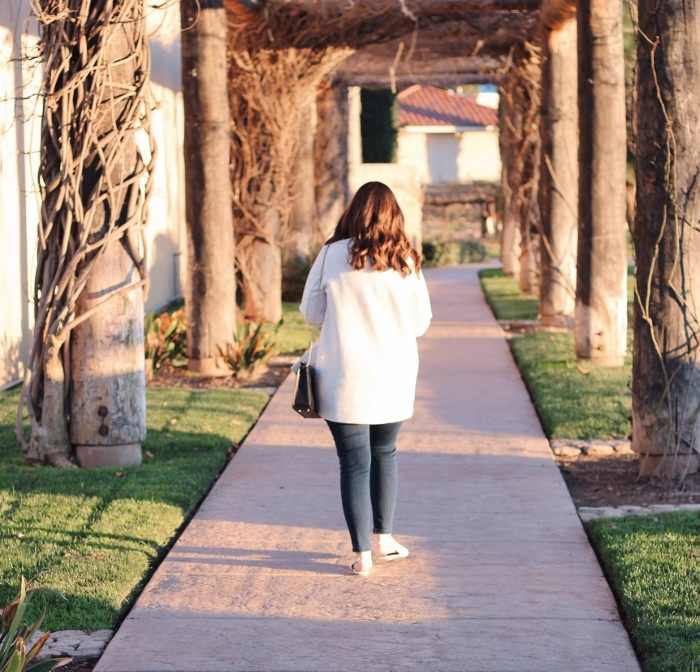 I almost jumped right into discussing my intentions for 2019, but I always like to wrap up the last year here so I can get some closure and move forward. 2018 was actually a good year for me. I was able to curtail my spending, I enjoyed more time outdoors, I made my health a priority, and I took a fun trip to Mexico with my best friend. But in the interest of being completely honest and transparent with you guys, it was also very inconsistent. Meaning, I was very inconsistent. I think I made some headway in managing my anxiety and depression, but it was more of me just pasting a smile on my face and trying to will myself into contentment. In reality, I spent a lot of time ruminating and I went back and forth from being social and having a full calendar to feeling utterly alone and isolated. As usual, I did it to myself. I'd have weeks where I felt great, and then my mood would completely shift and I'd have weeks where I wouldn't even want to leave the house. I would tackle a goal, but then retreat and feel like a total failure. I did this in so many areas of my life. Exercise, school, even blogging. Sometimes, positive thinking can actually do more harm than good if you're not addressing an issue. Because although my attitude in general was much more positive in 2018, there were still negative thoughts brewing underneath the happy platitudes, and really I just tried to conceal them rather than overcome them. Fake it til you make it! It sounds great and all, but after awhile I just felt like I was faking everything. It became exhausting at times, and that's when I would withdraw. There were events I missed, appointments I canceled. I blogged less and tried my best to disconnect from social media. I sometimes wondered if I should stop blogging altogether, but I've always enjoyed it and I think I'd feel a void if I quit. So I'm still here! I'll discuss my outlook on 2019 in my next post, but I don't have ANY expectations as of now. The best parts of last year came from unexpected plans, spontaneous little adventures, and spending quality time with the people (and four-legged friends) that I love and I just want to continue to do more of that. Seeing these beautiful ladies over the holidays was most definitely a highlight of 2018. I wish we all lived closer so we could get together more often! We all met for dinner at Rustic Root in downtown San Diego and then went to a bar across the street. How fabulous do they look?! So tell me, if you could sum up your 2018 in a word or phrase...what would yours be? Christmas is over and the countdown to New Years has begun! I hope everyone who celebrated enjoyed some quality time with loved ones. Nate has had a few days off so I haven't really been in the mood for sitting down to blog on my computer...My friend Rachelle decided to take the entire month of December off from blogging and I think that's the way to go! Oh, and more about Rachelle and meeting up with our other blogging friends soon! 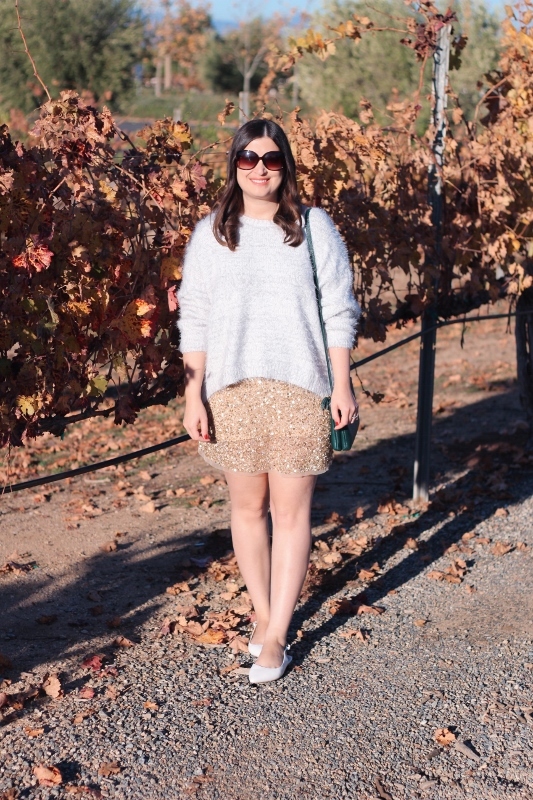 But for now, let's talk about sequins. They are ubiquitous during the holidays and for good reason. You can go all out in a sequin skirt or dress, or you can do what I've done here and dress them down a bit. Honestly this has been my favorite holiday outfit I've worn in years. 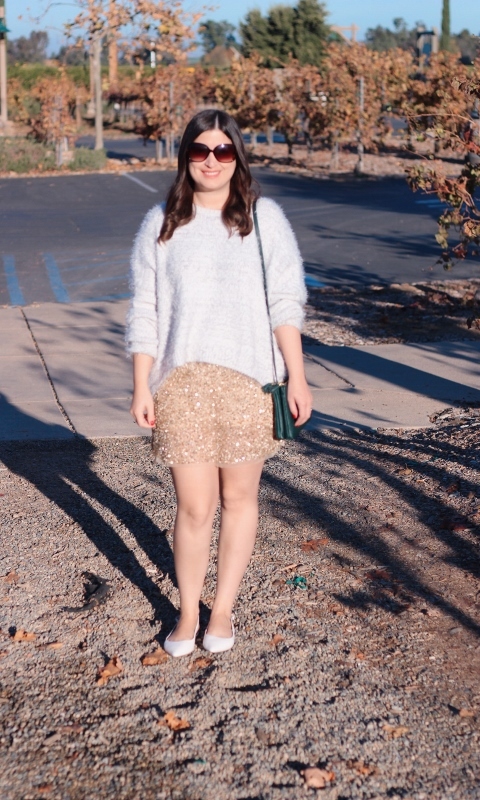 For any of my longtime readers, do you guys remember this gold sequin skirt? I think I've had it for about 6 or 7 years! Maybe longer because it was way before I got married. 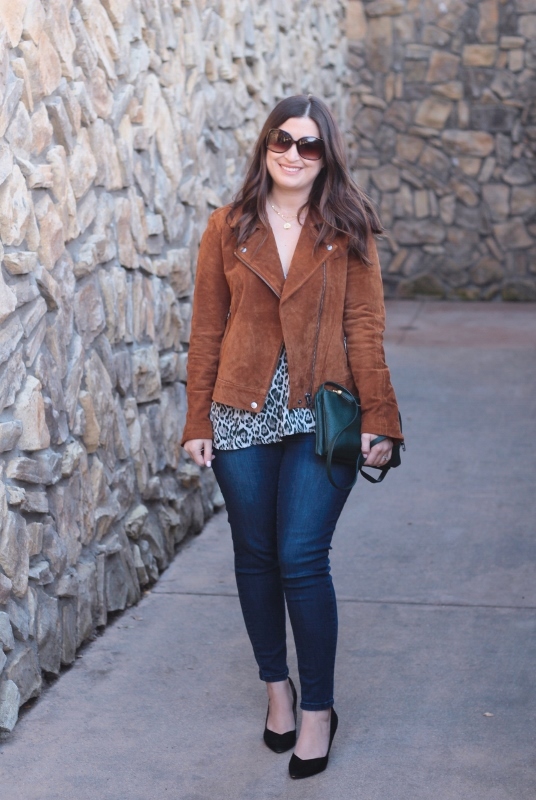 I bought it during a big Zara sale and wore the heck out of it. Somehow, miraculously, it has survived countless closet clean-outs. 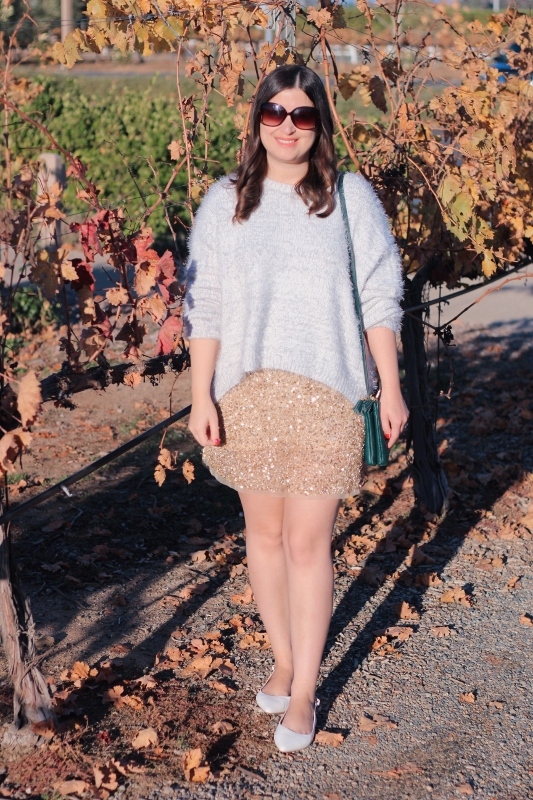 Recently I saw Helena from Brooklyn Blonde wearing an oversized sweater with a sequin mini, and it inspired me once again to bring on the shine for a nice dinner out. It would obviously be perfect for New Years Eve, although we don't have any plans yet so you might just find me in PJ's instead! Either way, it feels great to get reacquainted with an older item of clothing. It's like visiting with an old friend. Are you into sequins for the holidays? On Saturday, I co-hosted a Christmas party with my best friend at her apartment in San Diego. We wanted it to be fairly casual but also festive! When we arrived at their place, her husband surprised us by dressing up as Santa. She went all out with tons of shimmering lights, candles, a beautiful tree, and a naughty elf that kept sneaking up to her bar cart every few minutes. We exchanged white elephant gifts and laughed the night away. Honestly it was so much fun. The holidays can be pretty hard on us emotionally. We both get the holiday blues for different reasons...but celebrating together helps. I'm hoping it can become a tradition, something to really look forward to each year. In planning my outfit, I knew we were going to be inside most of the time so I just wanted to be comfortable yet also look put-together. I guess that's always my style philosophy! I love this Leith dress so much in gray that I had to have it in black as well. 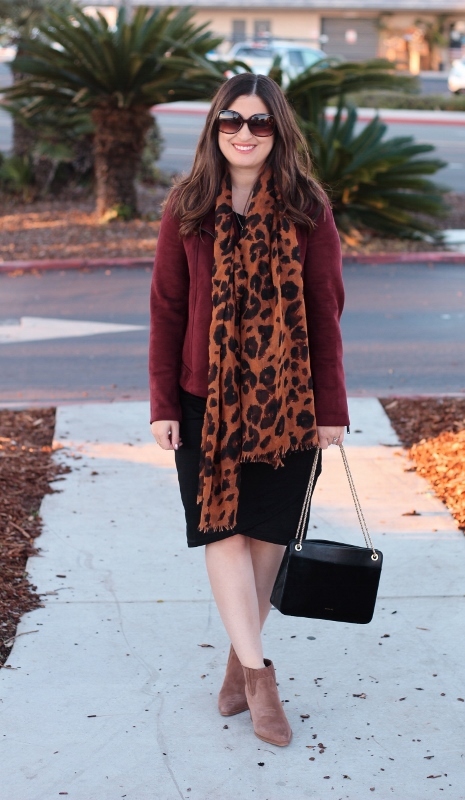 I threw on my burgundy jacket, a little leopard, and I was good to go. Have you gone to any parties yet this season? What did you wear? !